The news of Euro 2020, a 24-team tournament need I remind you, becoming somewhat of a European tour hosted across the continent in several countries, with each group played in a different set of cities among five, six or even more nations. You can blame it all on the economy. Not enough bids for Euro 2020. Only Turkey, who suggest that it was promised to them by Michel Platini, a joint Georgia-Azerbaijan bid and another joint bid from Scotland, Ireland and Wales. This is somewhat a problem Platini created himself, turning the world’s best tournament into a 24 team thing, which pushes the costs to levels which many countries in a cash-strapped Europe don’t want to handle. The disappointing response in the form of only three bidders, with both Turkey and Azerbaijan also pushing to host the Olympic games that summer led to a change of concept, or more accurately adopting one from something UEFA did with their U-17 tournament. In that way, a country like Portugal, one of the nations that are feeling the burden of economic problems these days more than others, can have a chance of hosting a match or two in the group stage, while hosting a complete tournament would simply be impossible at the current situation. It seems that very few nations in Europe can handle the size of such a tournament, financial crisis or not. The offer on the table right now is based on the seeding. All 24 countries that qualify to the tournament will be ranked according to the UEFA national team coefficient ranking. Based on that, the top 12 teams, two from each group, will get to host the group stage and round of 16. The quarterfinals would be played at a neutral venue, and the semifinals and final would be played in a 13th city. Any decision on venues will not be made until the spring of 2014 and the bidding process will begin in March 2013. 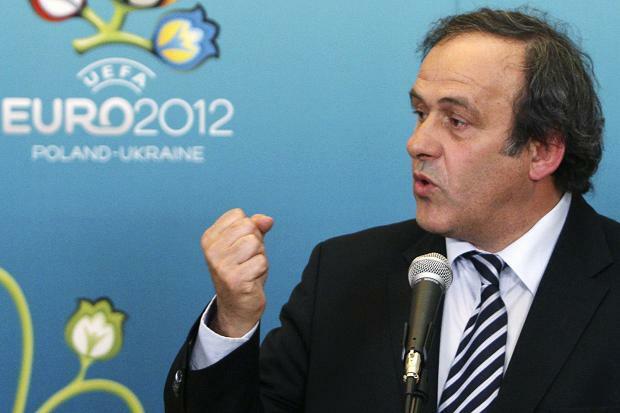 The decision is already widely criticized, with all fingers pointing towards Platini for making the tournament impossible to host for most nations, adding 20 matches (from 31 matches featuring 16 nations to 51 featuring 24) to the summer event. Maybe it’s a way for him to assure more nations get in, which helps him get more votes in the future, including when he runs for the FIFA presidency. So are we headed towards a summer with matches in the Santiago Bernabeu, Allianz Arena, Estadio da Luz, Stadio Olimpico and Wembley? Sounds interesting, but it might be wiser to put geographical needs before their seeding ideas. I know UEFA don’t think much of fans except for money spending organisms, but people might be forced to travel through an entire continent if he’s unlucky enough to get a bad venue draw.